These dishes are simple, but great quality. They shipped quickly and were exactly what I was looking for. Perfect! Dine in simple style using this 18-piece dinner set from Red Vanilla. The set is crafted from creamy white porcelain that will stand up to everyday use in the dishwasher, microwave, and at your table. The elegant set includes six dinner plates, six salad plates, and six soup bowls. 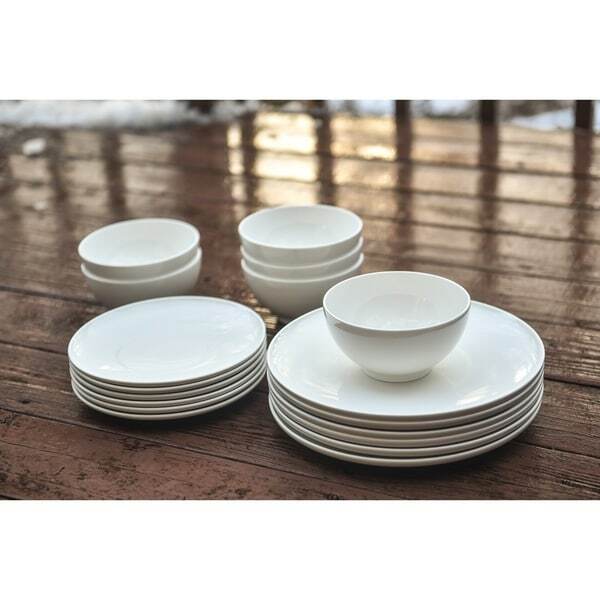 Six Dinner plates 11" x 11" x 1"
Six Salad plates 8.5" x 8.5" x 1"
Six Coupe soup bowls 6" x 6" x 3"
I bought this set as well as "Red Vanilla Everytime White 16-piece Dinnerware Set" to get 10 dinner plates, 10 salad plates, 4 mugs, 6 cereal bowls, and 4 pasta bowls. This combination was the best for us—we didn't need many more mugs and wanted the two types of bowls. We use this as our regular set, therefor they see daily use. I've waited to write the review in order to let people know how they hold up. So far, four months in, there has been no scratching/deglazing. One plate has chipped, but that was our fault. The white is a creamy white, which I love. If Overstock allows photos, I'll post some! But seriously, you should buy these; I looked a long time before finally choosing and I couldn't be happier. love these plates. We find we use the salad plates as our dinner plates because the dinner plates are really big. Already have the other set with the plates/salad bowls/mugs so this was perfect to add on to the plates and have better bowls for soup and no need for more mugs. I have this set in the 24 piece with pasta bowls and mugs. Always wished there was a deeper, smaller bowl instead of the pasta bowl, and without the mugs. And here it is. Now have service for twelve, with 12 each of the basics, and six each of two types of bowls. Worked out well. Superb quality and timeless simplicity, just as the first set. We love this set and would recommend it if you are looking for a simple, well made, white set. Love the sleek design. I've used them for a year and have had no chipping. The dinner plates are really large so we use the salad plates most of the time. I have been looking for new white dishes for a while now. There seemed to be either stark white or bone white dishes. . . .These fall somewhere in between which I love. They are a slightly "warmer" white than the stark white, but are not ivory colored like bone china. I had to order this and the red vanilla bone china set to compare. We've only had the set for a couple weeks so I haven't managed to chip anything just yet, but so far I'm thrilled with the purchase. I ordered 2 sets of these. One plate was broken when I received them. I emailed customer service and within a couple of hours I received a response. The very next morning Jose from Red Vanilla called me to confirm which plate was broken so that he could send a new one right away. Later that day I received shipping notification for that plate. Then the next morning I received a call from Overstock.com customer service to make sure everything was taken care of. Not only are these dishes great - the customer service I received was even better. Customer service at this caliber is rare these days! Thank you, Overstock! These are fantastic dishes! I just unboxed them and love them already. They are a nice weight and the surface is very smooth. The dinner plates are 11" but they aren't heavy. Very "home bistro" looking. They will look great stacked behind my glass-front shelves. I'm considering ordering the Hostess Set. Tip: there is a sticker on the back of each item. To remove it, let a few drops of rubbing alcohol set on the sticker for a few minutes. It will slide right off! I used the shipping box and packing material to box up my old dishes to donate. Looks great and customer service at overstock is amazing. Always prefer to buy from overstock if their price is competitive with others. shipped very fast. Cheap quality and different sizes within plate sizes. Would not rebuy from that company. These dishes have held up very well. They don't show any marks from the silverware. My only complaint would be if you are getting food from around the edges of the large plate with any force the plate will tip since the base has a much smaller circumference. I've been using these for a few months now and they have held up perfectly! (My kids put the dishes away so that's saying something.) They are an elegant, minimalist design and can easily be used for everyday and formal dining. Food looks really pretty plated on them too. I will purchase a few additional pieces once they are back in stock. These dishes are so cute! They look awesome openly displayed on my door-free kitchen shelving. They're so affordable and of decent quality. I like the raised lip on the plate edges. I would buy these again. Really nice...very happy with my purchase. I LOVE THESE DISHES!!! I have had them for almost two years and the quality beat my expectations. They still look like new!!! "what is the weight of the dinner plate?" The dinner plate weighs about a pound. I just weighed a dinner plate and was surprised that it came in at 2 pounds. Quite a difference from the previous answer from Overstock. "What is the difference between porcelain and bone china? Can't decide which one is stronger." Both are of superior quality and it all just depends on what your looking for. Bone china is usually thinner and the glaze is smoother than porcelain china. The glaze, however, is not as durable as porcelain china since it is softer. "Do these plates have a simple lip around the edge? it looks like they do and that is what I am looking for. Thanks in advance!" Yes these plates have a cupped lip edge. Yes, it is a simple lip. Very classic and timeless. "What is the diameter of the dinner plates ?" The dinner plates are 11-inches in diameter. "Hi, can you please tell me if the bottom of the plates and bowls are glazed or not?" The bottom of the plates and bowls are glazed. The quality is superb. Because I needed to add to what I already have. Adding to my existing set. "Please confirm which of the two listed descriptions is correct. Service for: Six (6), Number of pieces in set: Eighteen (18) OR Set includes: Four (4) Each Dinner Plates 11 inches, Salad Plates 8.5 inches, Soup bowls 7.75 inches. (This equals 12 pieces)"
Hello ButterfliesAndBows, we apologize for the confusion. This set includes 6 dinner plates, 6 salad plates, and 6 Bowls. Thanks for shopping with us!